The specification for high visibility clothing to be worn by UK railway maintenance workers is set out in the Railway Group Standard. A train is not capable of stopping within a short distance, and drivers can do relatively little to prevent the injury or death that results from a collision with humans (or animals). However, drivers of locomotives do have the ability to signal their approach by the use of a warning horn. Therefore, it follows that the sooner a driver recognises a person on a track, the sooner a warning can be given to signal the approach of a train. All railway tracks require maintenance. It is rare for a rail service to be suspended during routine jobs, which means people have to work in close proximity to busy lines, albeit with train speed restrictions implemented in areas subject to working. To increase the visibility or conspicuity of workers, a number of actions can be taken. Warning lamps and signalling devices may indicate work activity. However, these do not indicate the location of individual workers. To achieve this, personal protective equipment (PPE) is required. 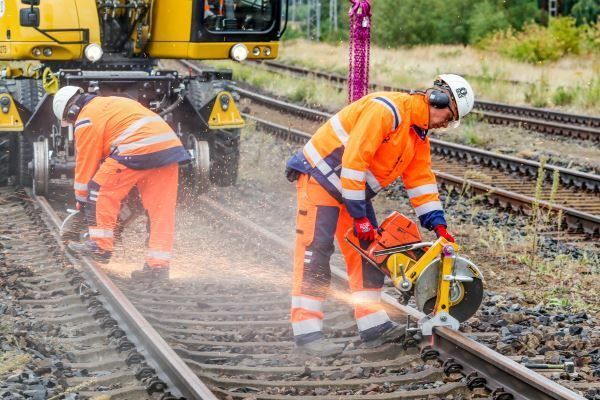 On the UK railway network, the wearing of high visibility clothing has become a mandatory requirement for all persons associated with track or lineside working. Railway workers may find themselves carrying out maintenance work on track, where no trains are running – called 'green zone working'. However, much work is undertaken on active railways, during day and night, and under different weather conditions. Under such circumstances (known as 'red zone working'), the dangers are real and ever-present, and it is important that the highest levels of visibility are maintained. The main feature of high visibility clothing is that it is made from materials that aid conspicuity by day and night. To enhance the visibility of a wearer during the day, garments are made from fluorescent materials of standard colours. The visibility of a person is aided at night by the inclusion of retro-reflective tapes within the construction of a garment. Retro-reflective materials reflect a high proportion of light back towards its point of origin. There is a large range of high visibility clothing available. However, there is a particular specification for clothing that is allowed to be worn on the UK rail network. The specification is set out in Railway Group Standard GO/RT 3279:2013, a document that defines the 'minimum requirements for high visibility that is to be provided for wearing by people when on the lineside or on or near the line'. The document also sets out special requirements for the high visibility clothing of Rail Incident Officers, who may be on a track following accidents. The GO/RT 3279 standard is based on the European standard EN ISO 20471:2013. It requires garments to meet at least class 2 (the mid-point of a 3-class scale) of EN ISO 20471 for the minimum area of high visibility materials used within a garment. Whereas the European standard permits several different colours of high visibility materials, the railway standard specifies an orange colour. These fluorescent garments for night-time visibility feature retroreflective tapes. Railway locomotive headlights pick out retro-reflective materials in high visibility clothing. Again, the railway standard draws on EN ISO 20471:2013 and specifies materials for use that meet the highest level of photometric performance criteria that are specified within the standard. GO/RT 3279 also defines the requirements for a high visibility minivest. These are required to conform to class 1 design requirements of EN ISO 20471:2013, except they need to exceed the requirements in EN ISO 20471 for both the minimum area of the orange background material and retro-reflective tape used in the garment. All high visibility clothing products, as defined in European Standards or the Railway Group Standard, have to incorporate both fluorescent and retro-reflective materials. For professional use garments, such as those defined in EN ISO 20471, there are three defined colours: yellow, orange-red or red. GO/RT 3279 specifies an orange colour. Although the specifications for colour may differ between standards, the same colour parameters are assessed: chromaticity (colour) and luminance (brightness). SATRA can carry out spectrophotometer measurements on the colour of the background material used in garments. Testing of the background material also includes colour fastness and various strength tests on the materials. Various pre-treatments are conducted on retro-reflective materials preparatory to evaluation. These are undertaken to assess the durability of a tape over its useful lifetime. Pre-treatments of retro-reflective materials prior to testing include temperature cycling, cleaning, abrasion, and simulated rainfall. It is essential that retro-reflective materials are evaluated to define their effectiveness under different conditions. They must withstand a defined number of cleaning operations and be labelled to indicate how long they can be usefully expected to last. The GO/RT standard states that the visible materials of the garment must not be compromised by the addition of company names or logos. SATRA can assess the design characteristics of high visibility garments according to the UK railway standard. When EC type-certification of products to GO/RT 3279 is required, this is carried out in conjunction with an evaluation to EN ISO 13688:2013. This standard touches on a range of requirements which cover issues relating to physical parameters, design, physiological properties and also health and hygiene. SATRA can advise on the types of testing required for any particular standard, which may also depend on the materials used in, and the construction of, different garments.